It’s true! Warped Tour – the longest running traveling alternative music festival in the country draws a crowd of individuals with multiple tattoos and body piercings and florescent colored hair. 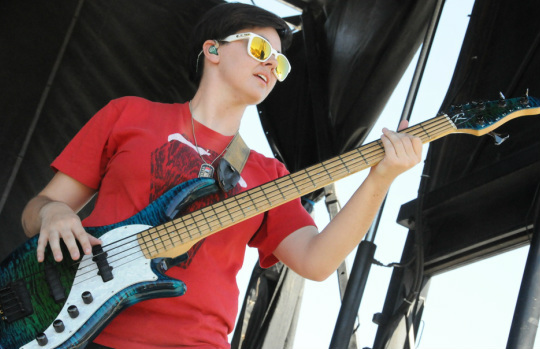 But the concerts also draw crowds of music fans like 18-year Austin Pryor, a high school senior from Bullhead City, Ariz. In fact, there are a lot of young men and women like Pryor who attend these concerts around the country, said Sgt. 1st Class Timothy Staudacher, NCOIC for Recruiting Command’s Musical Outreach Team. According to Staudacher, most of the attendees at these concerts are no different than the teens the team engages at the high schools they visit around the country. “Each concert will draw on average about 15,000 fans – with a large percentage being kids who fall in our target market. They’re between the ages of 15 and 24, they’re in shape and probably only about 10 percent would be disqualified for tattoos and body piercings,” said Staudacher. That’s why, for the first time, USAREC’s musical outreach team, featuring singer Sgt. Corrin Campbell, is performing at the concerts – all 44 of them. From now until Aug. 3 there will be a Warped Tour performance every couple of days somewhere in the country. Battalions are encouraged to send recruiters to support the Army booth set up by the Musical Outreach Team. 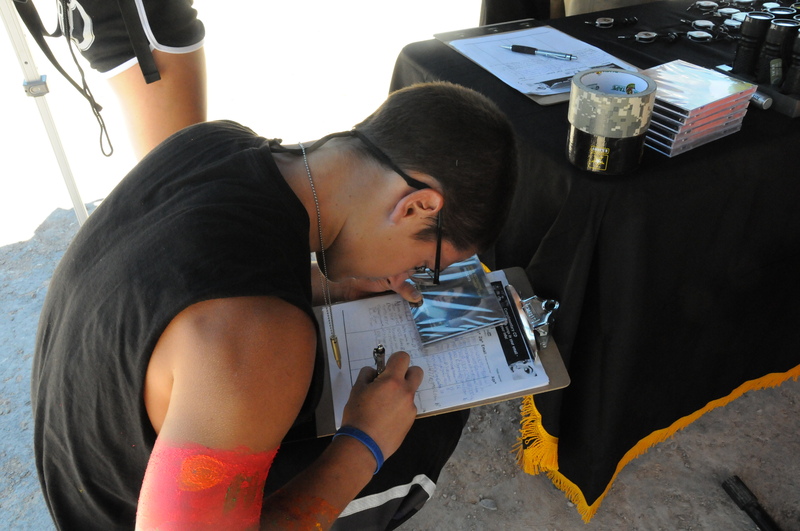 Attendees sign a lead card to get a free CD of Campbell’s music and take the pushup challenge to win Army branded PPIs. Pryor, who plans on joining the Army to become a helicopter pilot after college, did 50 pushups – the minimum amount necessary to walk away with an Army backpack. Jonathan a 19-year-old firefighter from Los Angeles, Calif., who didn’t want to give his last name, took the pushup challenge as well. Due to a sprained wrist, he said he was only able to pump out 48. Already resembling a Soldier with his short cropped hair, Jonathan said he too didn’t indulge in alcohol or drugs and would like to join the Army. The team collected 210 leads in Las Vegas, including the two hard leads. Staudacher said they normally collect more than twice that many when they have recruiter support. To find out when the Warped Tour will be in your area go to http://vanswarpedtour.com/dates. You can also contact Sgt. 1st Class Staudacher at 502-472-0911, 719-502-9808, timothy.j.staudacher@mail.mil, to coordinate support. Sgt. 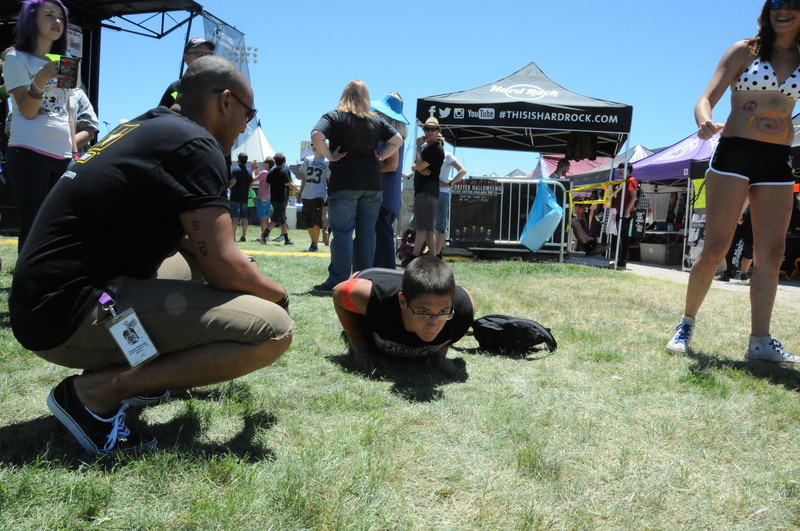 Keynon McBurney, the drummer for USAREC's Musical Outreach Team counts the pushups being executed by 18-year-old Austin Pryor at the Warped Tour in Las Vegas, Nev., June 19. The musical team performed at the traveling music festival and conducted pushup challenges at the Army booth. 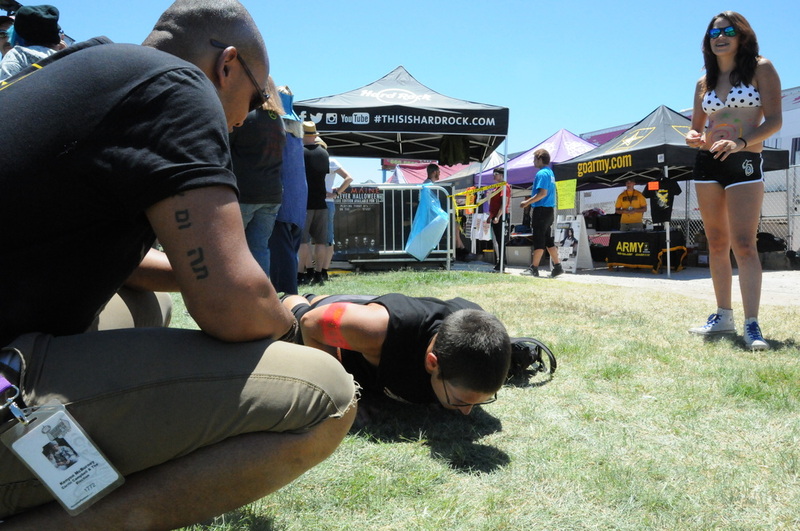 A nineteen-year-old firefighter takes the pushup challenge at the Warped Tour music festival in Las Vegas, Nev., June 19 under the watchful eye of Sgt. Jason Stoddard. Stoddard plays guitar for USAREC's Musical Outreach Team, which performed at the festival. 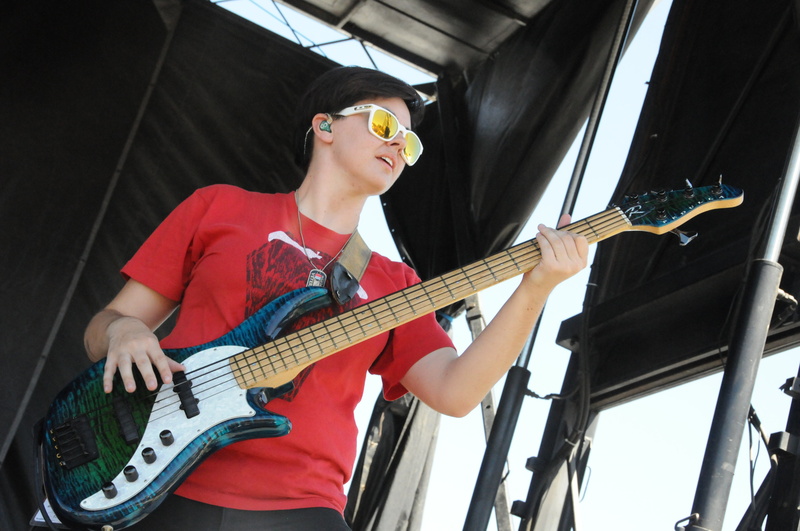 A prospect signs a lead sheet at the Warped Tour music festival in Las Vegas, Nev., June 19. 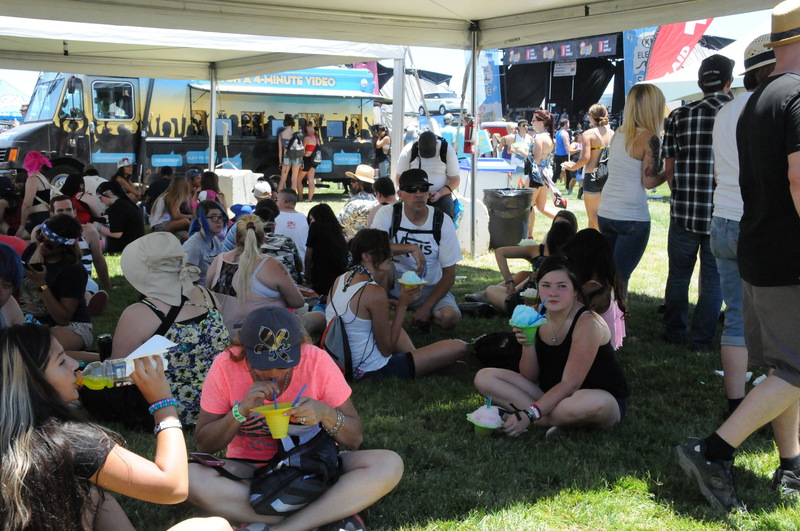 Attendees at the Warped Tour music festival in Las Vegas, Nev., June 19 gather under a tent to escape the desert summer sun.